How do I cross post to another group? How do I create a new version of an existing document? A: The MISMO Connect collaboration tool is available to employees and contractors of MISMO Member organizations as a part of the MISMO member benefits package. Your login credentials are the same as your MISMO/MBA profile. Your username is your email address and the password is the one you have set up in your profile. If you have forgotten your password, click the "forgotten password" link on the log in screen or if you need further assistance with your login information, please click here. A: On your profile page, please select the pencil icon next to "Contact Details" in the left column. A: Please navigate to your profile page, then select the "My Account" tab and choose "Privacy Settings" from the drop-down menu. This will let you control what information is visible to whom. After you’ve made changes, click the “Save Changes” button at the bottom of the page. Please note that the default initial settings are set to only share your email address with your established contacts. You can adjust the visibility of all of your information within your account settings. A: Look for fellow community members listed at the bottom of each of the community sites. A: Communities allow you to participate in discussions and share resources with other members. Each of MISMO's Workgroups have a community site where they house and maintain their meeting agendas and minutes and other various documentation in their library, post discussions (the content is searchable) , provide meeting information, post announcements and more! Many of the MISMO Committees also have communities which have been set up as "invitation only" and are viewable only by the committee members. A: Go to “Communities” in the main navigation bar. Select “My Communities” to view the communities you currently belong to. A: Click on “Communities” in the main navigation and click on “All Communities” in order to see a list of available communities. Click on the community that you wish to join and simply click "Join," then choose a delivery option for posts (Real Time, Daily Digest or No Email). The "Real Time" delivery option is recommended so that you are sure to receive updates to meeting schedule changes/cancellations and other important information in a timely manner. The "Real Time" delivery option is recommended so that you are sure to receive updates to meeting schedule changes and cancellations in a timely manner. A: Go to your profile and click on the "My Account" tab. Choose "Community Notifications" from the drop-down menu. Here, you will see a list of available communities and those to which you’ve subscribed. Select "Leave Community” under the Actions column for the discussions you wish to leave. A: To respond to a discussion post, please navigate to the discussion post and click “Reply to Discussion” to send your message to the entire community. To send a message to the only author of the post, please select “Reply to Sender” (located in the "Reply to Discussion" drop-down). We recommend replying to the sender for simple comments like “me, too” that add little value to the overall discussion; and replying to the entire community when you are sharing knowledge, experience or resources that others could benefit from. Q: How do I cross post to other groups? A. To communicate with another community you must first be a member of the community to which you are trying to post. Only when you are already a member of that community, will the option to cross post your discussion item to that community appear. A: Go to “Participate" > “Post a message.” From an email (HTML version) for a particular discussion forum, you can use the “Post Message” link located at the top of the discussion email. A: If images are not appearing, it is likely that your email client is set to suppress images. This should be something you can change in your security or viewing options. If you would rather receive text-based email, go to your profile page and click on the "My Account" tab. Choose "Community Notifications" from the drop-down menu. Select the “Plain Text” format option for each of the discussions you are subscribed to. A: Yes, please enter a keyword in the search bar located in the main navigation. To refine your search results, please select "Show Advanced Search". 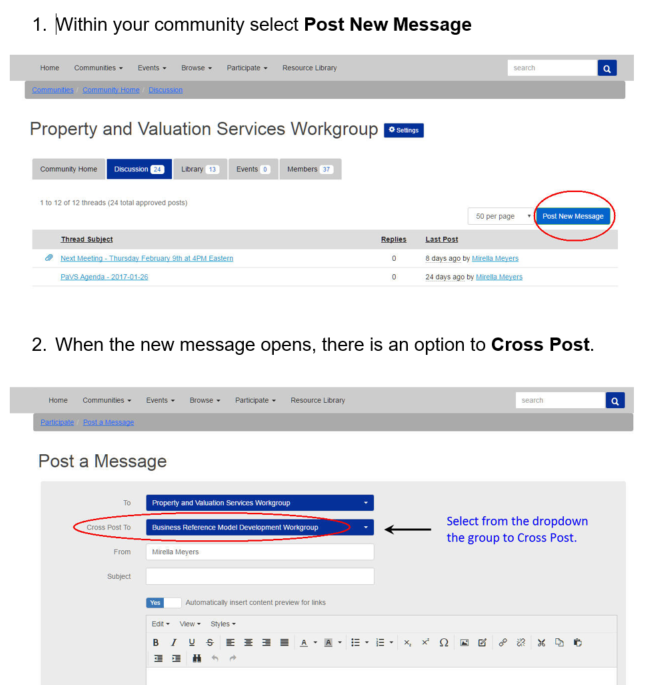 A: Locate the community you are interested in viewing from the appropriate communities page. Click through the community's landing page, then click on the “Discussions” tab. If you see a post you’re interested in, click the subject line which will take you to the entire thread. “Show Original Message” at the bottom of all of the posts in a thread will display the original message that started that discussion. A: If you know which library the resource might be located in, find the affiliated community via the All Communities page. Click through the community's landing page, then click on the “Library” tab . If you do not know where the resource might be, enter search terms in the main search box the same way you might enter search terms into Google or another search engine. 2. You can also upload documents directly to a library by using the “Share a File” link found under “Participate” in the main navigation or "Create New Library Entry" button on any community's library page. Library resources are not required to be associated with a discussion thread. Q: How do I upload documents? STEP 4: Add Title and other information, as prompted. Title: It is recommended that Workgroup’s use a naming convention for Titles that begins with the year_month_day_file name. Example: 2016_01_22 Sample Doc This will keep your list of documents within the folder in date order and make items easier to locate. Description: While not required, a description is recommended to be provided to make it easy for users to understand the purpose of the document. Entry Type: “Standard File Upload” accommodates the vast majority of MISMO documents. Only choose other entry types should they be applicable. Owner: This is optional and should be used only as applicable. When done completing fields, click “NEXT” at bottom. STEP 6: Click in blue oval “Choose Files”. Note that you can choose to upload multiple files at one time. The files will appear within the item you’ve titled in alphanumeric order. It is important to title your files Example: 2016_01_22 Sample Doc This will keep your list of documents within the folder in date order and make items easier to locate. STEP 7: Follow prompts to upload file. Then click “Next” at bottom. STEP 9: Tags will be developed by MISMO staff and populated for selection so that you can tag your content so that it can be found upon searching. STEP 11: Return to the Community Library to confirm that document appears as intended. – and – You’re done! Q: How can I create a new Version of an existing document?